India's opposition leader LK Advani has appeared in court and been charged with inciting Hindus to attack a mosque in the town of Ayodhya in 1992. 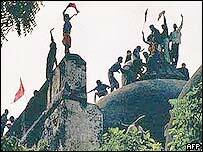 The demolition of the Babri mosque sparked religious riots in which more than 2,000 people were killed. 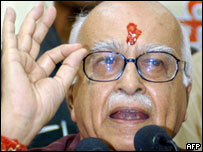 Mr Advani has denied any wrongdoing over the destruction of the mosque. A court had ruled that Mr Advani had no case to answer, but an Indian high court then overturned the ruling in 2003 and ordered him to stand trial. Mr Advani, who heads the main opposition Bharatiya Janata Party (BJP), appeared before a judge in a lower court in the northern town of Rae Bareilly to answer charges about his alleged role in the demolition of the mosque. He was accompanied by seven other defendants, including two of his former colleagues in the cabinet - Murli Manohar Joshi and Uma Bharati. "This is the first time all the eight accused have appeared before the court," a lawyer for India's top investigating agency, the Central Bureau of Investigation, PK Choubey told the BBC. He said the judge read out the charges "regarding giving provocative speeches leading to demolition of the mosque, creating enmity between Hindus and Muslims and inciting people for riots and public mischief". Mr Advani and the seven other defendants were released on personal bonds and told to appear in the next hearing on 30 August. The BBC's Ram Dutt Tripathi in Rae Bareilly says Mr Advani did not say anything in court and addressed a public rally in the area after the hearing was over. He told supporters he was sure the Indian people wanted a permanent Hindu temple built at the Ayodhya site. The site, in Uttar Pradesh, has a makeshift temple amid continuing disputes with Muslims over ownership. "I am confident that people will not sit quietly till a grand temple of Lord Ram is built at his birthplace," Mr Advani said. BJP leaders said that the case against him was "politically motivated". "This is a false case. No one incited anyone. Hindus had come to do voluntary service that day, and they built a makeshift temple at the place of the mosque," BJP official Vinay Katiyar told Associated Press. Many Muslim leaders reject this view. "The demolition was a planned move. The workers came with axes and shovels. Leaders like Advani... asked their workers to raze the mosque," Zafaryab Jilani of the Babri Action Committee, which wants to rebuild the mosque, said. Earlier this month, six gunmen stormed the complex. One blew himself up and the others were killed during a two-hour gun battle with police. Mr Advani has always denied charges over his alleged involvement in the destruction of the mosque in 1992. A local state court had in 2003 acquitted him while ordering seven others, including a former minister, Murli Manohar Joshi, to stand trial. But the high court in Allahabad in Uttar Pradesh overturned the ruling following a petition filed by two Muslims who argued Mr Advani could not be exonerated while the trial of the other seven continued.